Nine are reported dead after a shooting at an historic African American church in Charleston SC. I haven't seen any other reports of mass violence, so we're looking for a Bloodbath Formula that's probably dependent on very transient factors, like house cusps and/or the position of the Moon. 1. Pallas ruled by Jupiter which is in the Eighth House and weakly quincunx Pluto. 2. Neptune in the Second House quincunx Venus. 5. Fifth House ruler Venus quincunx Pluto. 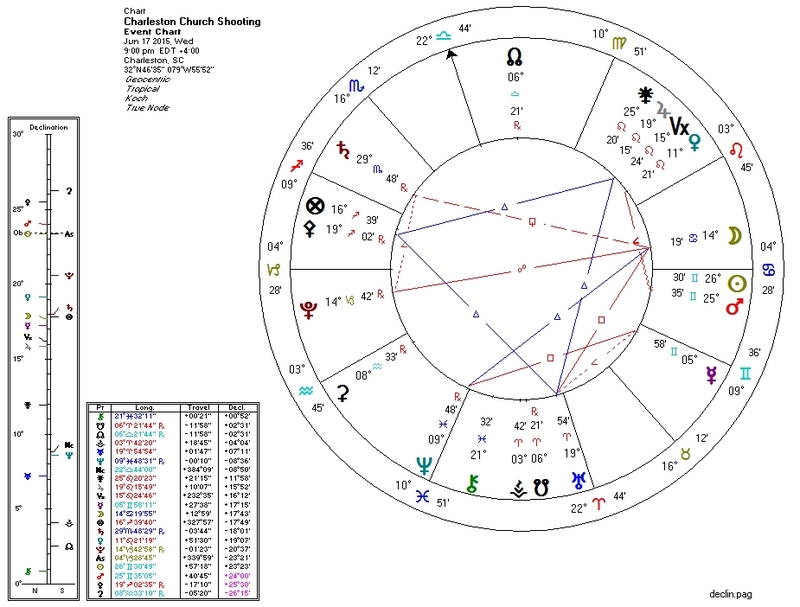 Uranus is on the IC, trine Jupiter, and the Moon (opposite Pluto) is in Cancer: these lend some credence to reports that this crime was racially motivated.